EVer wanted to invest in a PC that truly gives exciting gaming experiences? Tired of having to play old games over and over again until you can practically go through each level blindfolded? We're here to help. 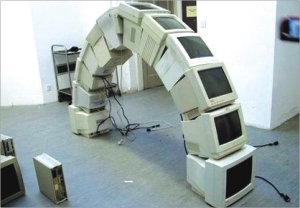 After quite a bit of research, we've collected and assimilated information for the needs of you, the PC gamer. We've rated each of these four Gaming PCs much like the difficulty selection in a videogame. Starting with the workhorse-like Easy to the Medium powerhouse we go on towards the elite Hard model and the ultimate beast: the Extreme Gaming PC. Note that prices are updated as of printing and are subject to change. They're merely there to give you a rough idea of how much it's going to dent your wallet. 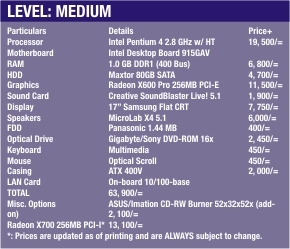 Also, these PCs have been designed with the PC gamer in mind, so obviously they'll be pricier than more normal models, innit? 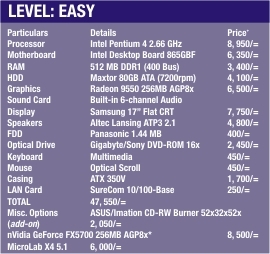 Let's start with the entry level machine with prices listed in chart titled Easy Level. This is your basic, no-frills, bare-bones Gaming PC. General tasks such as DVD-ripping, movie viewing, standard office applications and media editing will be handled quite well with this model, so expect suitable performance increments in the other models. Since we are dealing with game performance I decided to keep a 256MB video-card even for this the lowest-end model. Also, note the Flat CRT monitor which offers crisp, clean visuals at a more affordable price than an LCD monitor. 17” is a minimum requirement for enjoying your PC games (and movie experiences). Since prices are now relatively cheap, I've kept a DVD-ROM since most games are more readily available on the medium as well. 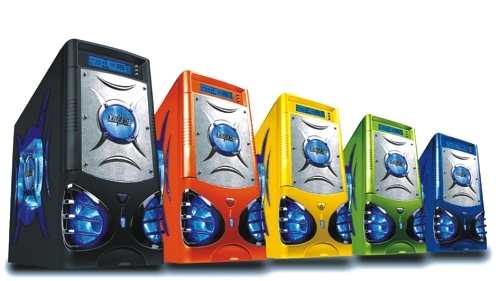 Altec Lansing speakers are generally the best available. You're getting greater sound fidelity and quality as opposed to the MicroLab model, despite the ATP3 being 2.1. The ATP3 is pretty much a value buy, in this case. Also, Altec Lansing speakers are quite stylish in design and really complement a high-tech gaming set-up. This ATI card isn't something you'll hear people rave about, but its cheap price belies the actual level of performance you'll be receiving! The nVidia substitute for those interested has been listed in the Misc. Options section. Also note that since there are many Product Partners for the graphics cards, you'll only have to make sure you're getting the correct chipset. Names like Sparkle, Gigabyte, et al mean nothing: as long it's an nVidia or a Radeon chipset it's all that matters! A LAN card is essential for perusing the InterWeb or for LAN/Online gaming if your connection is good enough. Also note that I've mentioned either ASUS or Imation for the writable optical drive. Once again it's a matter of preference. I've used an Imation CD-RW drive for about 3½ years now and it's still running strong with the same great performance it gave me while it was new. However, if you prefer ASUS, go ahead and make the purchase. Also, for the DVD-ROMs I've recommended both Sony and Gigabyte. Most people say Sony is excellent, and personal experience tells me a Gigabyte DVD-ROM drive is rather good too. Avoid ASUS DVD-ROM drives like the plague since they burn out easily. This applies for the next few models as well. If you want more we can move to the next level. Now we've moved onto the higher-end Intel motherboard which supports the new PCI-Express graphics format. PCI-Express offers much faster performance than AGP8x, but the products aren't as widespread. Even then, you should really take advantage of this new technology to up the ante of gaming performance even further! Here we use a HT processor but you shouldn't a big deal of it because the average BD gamer has no such need. Notice the jump to the SATA HDD. While the same size as the previous offering, the SATA transfer-rates are roughly 10x faster than the normal ATA drives. It's a rather huge jump in performance and something that's instantly noticeable. All subsequent models will use SATA drives as well. I've also moved up to ATI's X series of graphics cards which are currently market leaders. The other items follow suit. That's it for this week. In the next issue we will show you how to build the craziest machine that your money can buy.